It's two days until Valentine's Day and for those who have been busy and have not decided on anything yet, here are my latest picks for your sweethearts, girl friends, sisters or mothers. 1. Valentino Rockstud Platform Pump in red/poudre, USD895. 2. 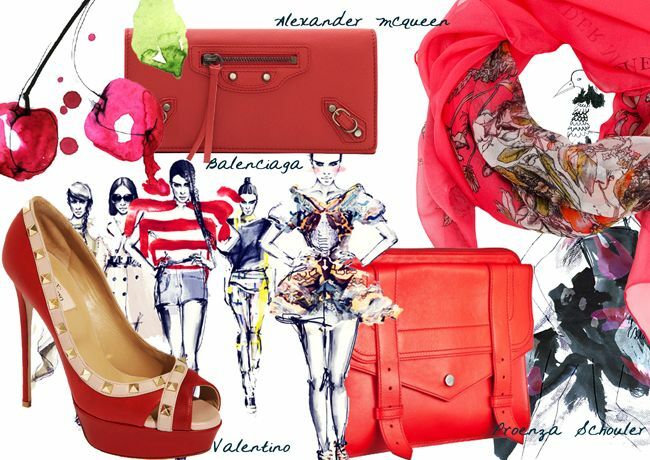 Balenciaga Money Papier in red, SGD595. 3. Alexander McQueen scarf in chiffon silk with floral skull print in coral, USD490. 4. Proenza Schouler PS1 iPad case in bright red, USD685. I can't find this product anywhere online but you can try it in store at Club 21 Four Seasons. Net-a-porter has it in neon coral. Surprise your loved ones. If you're looking to find other great items try searching through the large retailers at Promotional Codes and save money for Valentine's Day. Happy Valentine's Day everyone. Images from various sources, graphics by Ivonne. I love this photo's in your blogs. the shoes and clothes are fascinating..really cool! i love collecting this in my board and you can check this out.